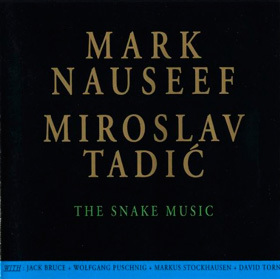 Music critics of L.A. Weekly voted The Snake Music one of ten best recordings of 1994. "When Nauseef and Tadić invite other players into their music, they coil and circle around them, discreetly establishing the terms upon which the improvisation will develop, shaping the atmospheres. It's a subtle manoeuvering - snakes are never bombastic -and suddenly a musician as strong minded as, say, Jack Bruce is singing and playing a little differently.